Download our Visitor’s Guide and take a look at the 45 pages. It will give you some information that you’ll find important and interesting as you prepare for your visit to the Amana Colonies. Inside, there’s a brief history of the Amana Colonies and an explanation of why we were established and want makes us unique. You’ll discover the difference between the Amana people and the Amish. You’ll also find a section with all the special event dates and a description of the event including our fantastic festivals. We have included a business directory and sorted them into groups to make it easy for you to find what you’re looking for, be it Food Shops or Antiques. There is also a section on lodging so you can determine what will best suit your needs. 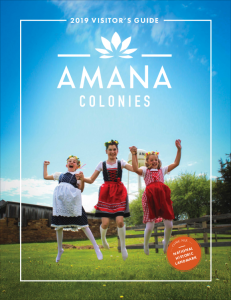 The Visitor’s Guide should help you make your Amana Colonies visit a great time.